Member of a polling station committee for Belarus' presidential election empty a ballot box prior to counting in Minsk, 11 October 2015. 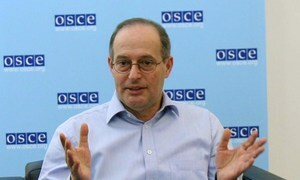 The United Nations Special Rapporteur on human rights in Belarus, Miklós Haraszti, today said that while the Presidential polls conducted in the country this past Sunday were not met with violence as in previous cases, no progress was made in serving the Belarusians’ right to free and fair election. “The election process was orchestrated, and the result was pre-ordained. It could not be otherwise, given the 20 years of continuous suppression of the rights to freedom of expression, assembly, and association, which are the preconditions for any credible competition,” Mr. Haraszti said in a press statement. The Special Rapporteur noted that none of the international and local independent election monitors could verify the official claims of 86 per cent voter turnout or 84 per cent endorsement of the incumbent. “Such high scores have never been claimed in elections in Europe since the end of the Soviet Union,” Mr. Haraszti stressed. “The observers’ documentations highlighted that not even the four days of coerced participation of prison inmates, army conscripts, and public servants under the label of ‘early voting,’ can give up the stated numbers,” he added. Mr. Haraszti also added that there were a high number of allegations of election-day fraud, such as undocumented handling of voter lists and ballots, voting on behalf of others, carrousel voting, ballot stuffing, voting without proper documents, and mobile voting abuses. In 2013, the Special Rapporteur had presented his report to the UN General Assembly on human rights in electoral processes. The report made several recommendations such as creation of independent election commissions with a pluralistic composition, initiating debates between candidates on national television. Yet, none of these suggestions were implemented. Mr. Haraszti also called attention to the intimidating environment of the electoral campaign. Calls for boycott of the elections were criminalized since the last elections. Political opponents, including an incarcerated 2010 presidential candidate, were released on the eve of the present presidential elections, but none of them have been reinstated in their political and civil rights. However, the Special Rapporteur welcomed the fact that the elections took place without violence, unlike the 2010 presidential elections. He also commended the protests carried out in Belarus against the perceived flaws of Sunday’s election. “I will closely follow what happens to the demonstrators in the aftermath of the elections, given that massive arbitrary short-term detentions and administrative discrimination are the order of day in Belarus,” he added. Additionally, Mr. Haraszti suggested possible immediate steps including eliminated the oppressive permission based regime of public life, repeal laws that criminalizes public activities without official permission, implementing electoral and media reform, secure judicial independence and introduce a moratorium on death penalty as a transition towards its abolishment. “Modernization processes which are not shouldered by democratisation and the respect for fundamental rights and freedoms are neither sustainable nor meaningful,” the Special Rapporteur stated, reiterating his readiness to cooperate with the Government on the starting steps of a reform. Mr. Haraszti further commented on the temporary four-month lifting of the European Union (EU) sanctions against Belarus, beginning in January, as signalled by the foreign affairs ministers of the EU yesterday, in response to the release of six political prisoners on the eve of the elections. An independent United Nations human rights expert today urged authorities in Belarus, the only European nation that still retains the death penalty, to impose an immediate moratorium on the punishment and refrain from carrying out further executions.